Pittsburgh Penguins goaltender Matt Murray stops a shot by New York Islanders' Jordan Eberle on Sunday. 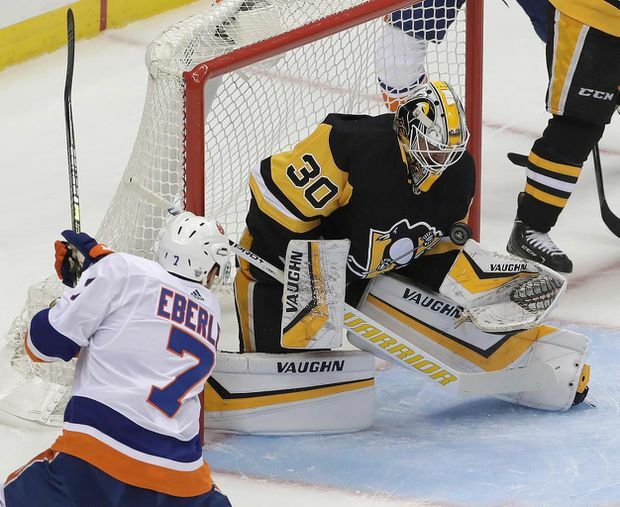 Jordan Eberle scored for the third straight game, Robin Lehner stopped 25 shots and the Islanders rolled to a 4-1 victory over the stunned Pittsburgh Penguins on Sunday to take a 3-0 lead in their best-of-seven Eastern Conference quarter-final. Pittsburgh head coach Mike Sullivan played down the idea his team was “desperate” while facing a 2-0 deficit for the first time in his highly successful tenure. He still opted to tinker with his lines in search of a spark, elevating Dominik Simon to the top line alongside Sidney Crosby and Jake Guentzel and putting Jared McCann — who sat out Game 2 with a lower-body injury — on the second line with Evgeni Malkin and Phil Kessel. Yet, the Islanders responded immediately. Eberle collected a pass from Ryan Pulock just above the goal line and flipped a shot short side over Murray’s right shoulder to tie it at 13:22. All of 62 seconds later, the Islanders were in front again when Nelson finished off a 2-on-1 by zipping the puck over Murray’s right arm.